Of course they didn’t phrase it that way, but I was given five separate PDFs for the available plans, A-D and H. H wasn’t available to me – it’s family-only. 3. So, which is best? Heck if I know! The whole point of spending known dollars on insurance is to control the risk of maybe having disastrously high spending. 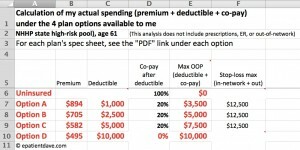 But… different premiums, different deductibles, different co-pay, different … aaaahggg! How do I choose? What if I get cancer again – which policy is best? What if I never have a single thing this year that requires a doctor visit? Which is best? Doing those calculations on paper is possible but I know Excel, which can do it faster and better and produce many many scenarios. Insurance companies have people who do this all the time. Ordinary families don’t. This is not a level playing field. It’s still not clear what’s the best option. You still can’t tell which plan gets better or worse as spending grows. Well, again from business, I knew what you do when the numbers are overwhelming: you graph them, so you can see the trends. 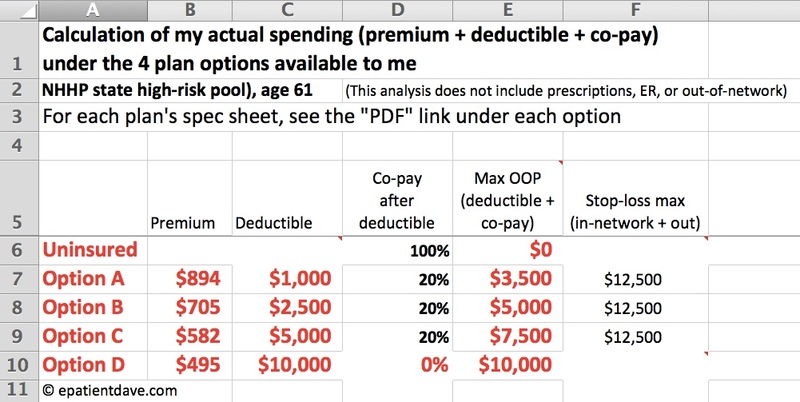 Once you hit $5000 of actual spending, options A, B & C are pretty much identical. 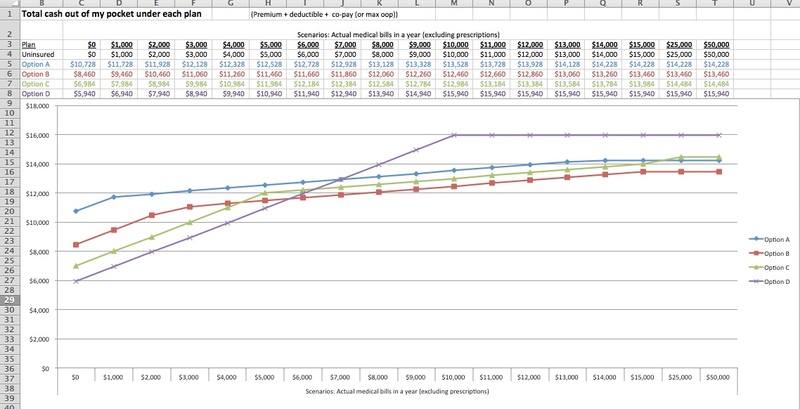 Below that level, Option D (high deductible) is cheapest. Above that level, that option becomes most expensive. Which one would you choose? Your answer may be different from mine: do you anticipate lots of bills or little? That’s always the choice with insurance – and you can’t answer it if you don’t understand how each option plays out. Said differently: You can’t be an informed consumer if you don’t have information you understand. I chose to place my bet on “I don’t think I’ll have a lot of spending,” so I chose Option D. It’s $10,000 deductible, so as you can see, up to $10k it’s a straight line: every dollar of medical bills comes out of my pocket. I was happy to take that deal, but it was hard. So I am sick to death of hearing that patients make lousy consumers. Having chosen $10,000 deductible insurance (which I was happy to do), I then got a diagnosis of skin cancer (not at all life-threatening), and became a highly activated consumer, shopping vigorously to find out what my options were and what they would cost. It did not go well – nobody was willing to help me find out the costs. In my view that’s nearly corrupt, except that I can’t find any individual who’s responsible enough to call corrupt – the whole stinking system just doesn’t work. So don’t blame us consumers. I’m curious if you shopped via any of the public or private exchanges? Aka marketplaces. Medicare.gov is one example for those who qualify. Healthcare.gov is another. Many insurers also offer exchanges that allow you to enter medications, general health conditions and demographics. 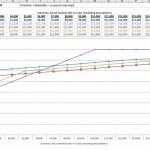 Subsequently they will predict total out of pocket costs. Hi Jeff – as I tried to convey, there were no other choices for insurance in New Hampshire when I shopped, in August of 2011. This was just to sort out which option I wanted, from the few available from New Hampshire’s high risk pool. Excellent post Dave! If only all consumers had that information easily available to them… It’s really a crime that they don’t.